“Will pick you up for dinner at 7pm,” Charles texted me earlier in the day. We have been friends since primary school and would catch up pretty often when he’s back in KL. Dining with him usually involves nice restaurants, slightly fancier food and good wines; all which I enjoy but my wallet would cry for help. 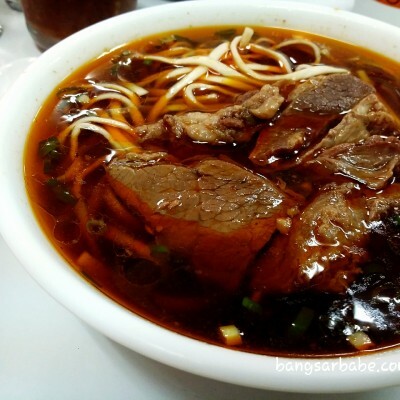 He drove me to Kota Damansara – braving the traffic jam and crazy drivers – to a neighbourhood restaurant called Little Yum Yum. The décor was nothing to shout about – basic tables and chairs, and walls adorned with frames of newspaper cuttings and the restaurant’s specialty dishes. 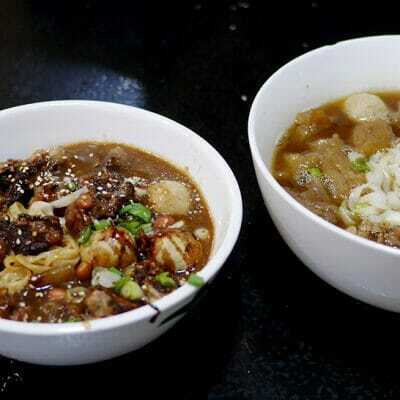 Little Yum Yum serves a mix of halal Nyonya, Thai, Vietnamese and Chinese dishes. Charles did the ordering and we tucked into a meal of Nyonya Gulai Tumis (RM12 – small), Creamy Basil Butter Prawn (RM19), Pandan Chicken (RM3.80 per piece), Yum Yum Special Egg (RM10) and Belacan Fried Four Angle Beans (RM10) that night. It was pretty humid, so we had the Wintermelon, Snow Fungus and Dried Longan (RM3.50 each) – refreshing and of just the right sweetness. 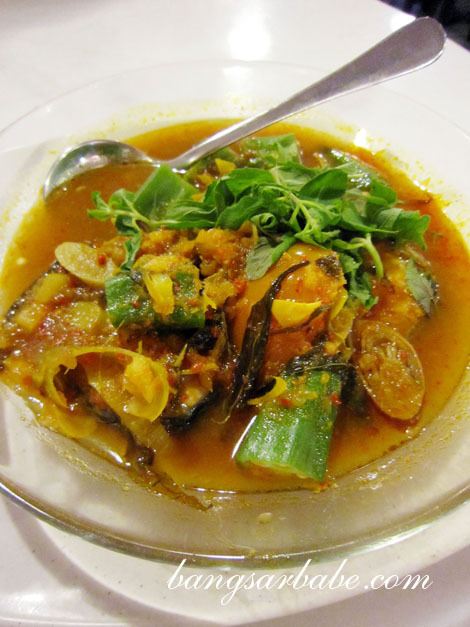 Gulai tumis is a spicy and sour curry which can be found in Nyonya households. Little Yum Yum’s version was pretty tasty and paired well with white rice. 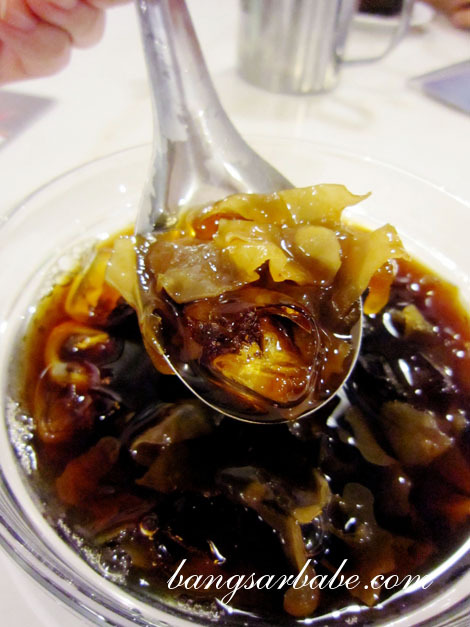 The tamarind-based gravy was aromatic from the bunga kantan and had a good balance of sour, spicy and salty flavours. I liked that the ladies fingers were not overly cooked and still retained their firm texture. 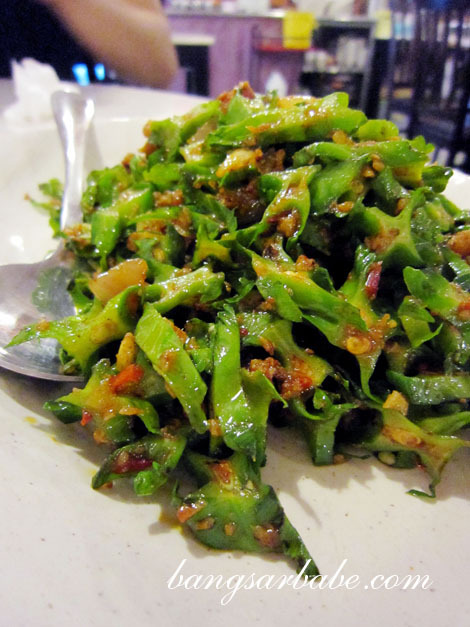 The belacan-fried four angle beans was a simple but well prepared dish. 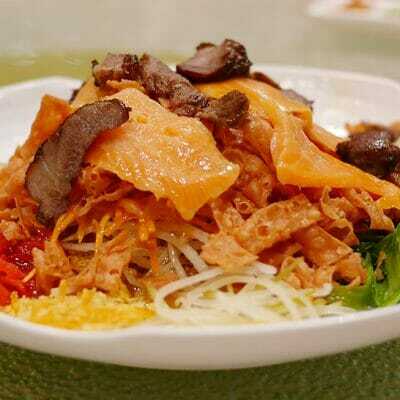 The combination of rich, pungent belacan, dried shrimp and chilli paste gave the still crunchy vegetables a spicy kick. It may not be authentic Thai, but the pandan chicken here is tastier than many I’ve tasted in Thai restaurants. The chicken pieces were tender and well marinated; I liked how the chef added caramelized onions at the centre to keep the meat moist and flavourful. No additional sauce was needed for this. Little Yum Yum’s special egg comprised a tasty medley of onions, minced chicken and spring onions, cooked into a fluffy omelette. The egg was slightly runny at the centre, which I thoroughly enjoyed. 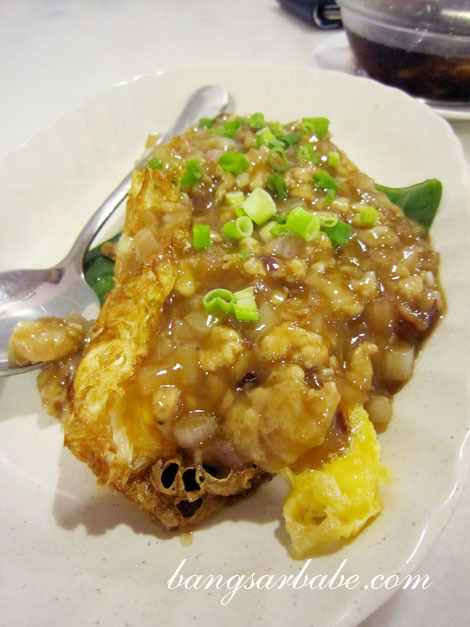 Simple, hearty and delicious, this could convert a non-egg eater to an egg lover! Next time, I’ll order a whole plate for myself. Another must-try dish is the creamy basil butter prawns – deeply addictive with a generous amount of thick gravy. Strange combination, but this tasted good. The batter encasing the prawns was thin and crispy, almost tempura-like. But it was the creamy basil gravy that made the difference. Possibly the Chinese version of pesto, it was sweet smelling, smooth and rich in flavour. I wiped the plate clean. For dessert, we shared a bowl of cendol (RM4). 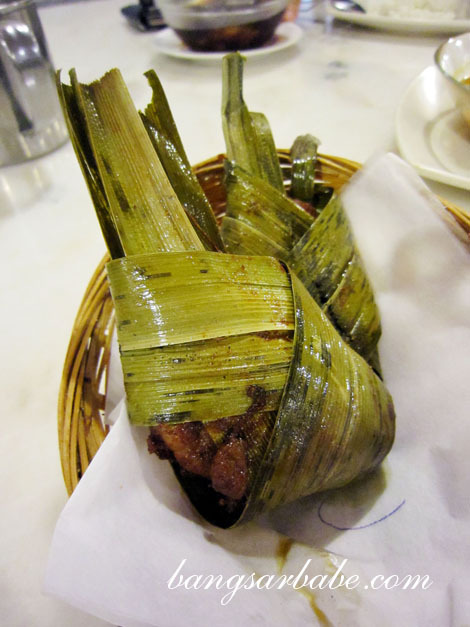 Portion was decent and I was told they make the ingredients – cendol strips and palm sugar – themselves. 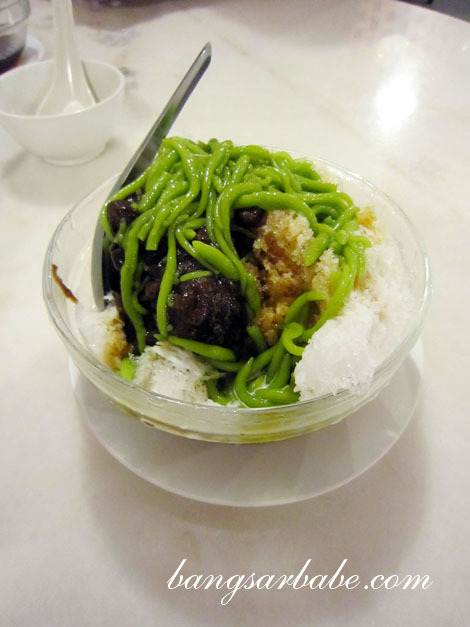 However, I didn’t find this cendol all that great. The palm sugar lacked aroma and depth, while the use of palm oil milk made this dessert less satisfying. 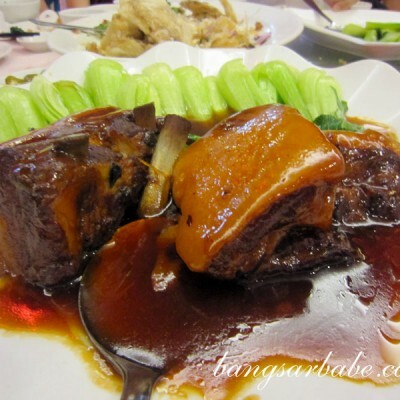 It lacked the body and richness only coconut milk can provide. Service was friendly and our food didn’t take long to be served. I liked that the portions were decent and the food was well flavoured throughout. Despite the food being a mish mash of fusion flavours (save for a few dishes), I enjoyed my meal. Dinner came up to slightly over RM70 for the above which was fairly reasonable. Definitely a place to consider for family dinners or a get together with friends. *Read my Star2 article here. Verdict: A good mix of authentic and fusion dishes. The creamy basil butter prawns and house special egg omelette is a must order! How come? I don’t think I live without eggs for more than 3 days! Love the name of this place.